Are you getting started on V-day cards?? Well, we're all in love over at CASology this week. 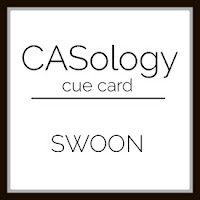 Our cue card is: SWOON. 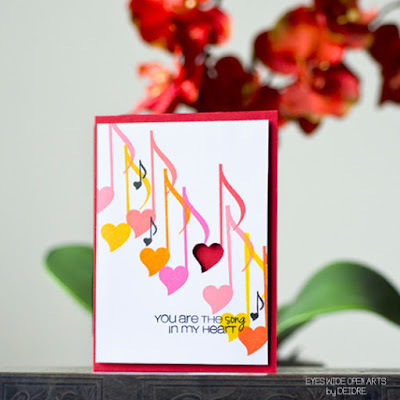 I have always been in love with music and this large music note stamp from the Love Notes set by Casual Fridays Stamps was calling my name. I stamped it in various shades of distress inks, and the sentiment with a few smaller notes from the same stamp set in black Versafine ink. For a last little detail, I took my favorite swivel x-acto blade to the red heart and cut out just the heart. I mounted it on red cardstock to match the red ink I stamped for the note. Time to swing over and see the swoon-worthy cards by the DT (including our newest members Bharati, Karen, and Kevin - say hi to them) and the guest designer this week. We're shining this week over at CASology! So pull out all your sparkly art supplies. Our new cue card: GLIMMER. In my silly head, I knew exactly what I was going to use for this challenge - "glimmer paste", right? Wrong, it's actually called glitter paste, but I think I accomplished the same end result lol. 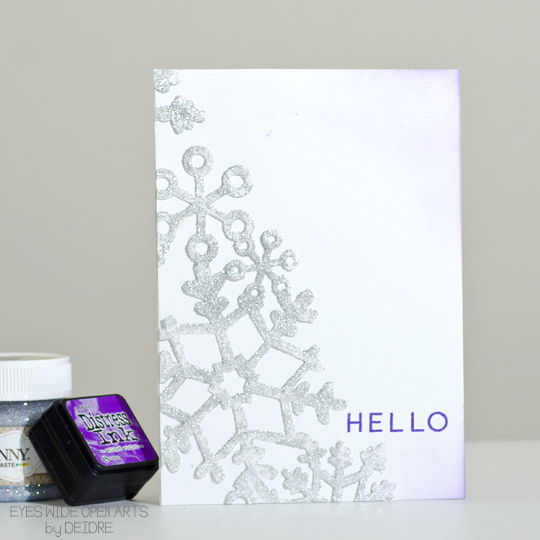 I had a laser cut snowflake background that I covered with silver "glimmer" paste ;) and cut on an angle. I stamped the sentiment and blended just the faintest purple in the corners...you may have to squint (I'm still getting my photo setup situated at my new place). BTW - this paste dries quickly, will stick to the paper as you coat it, and is super sparkly! 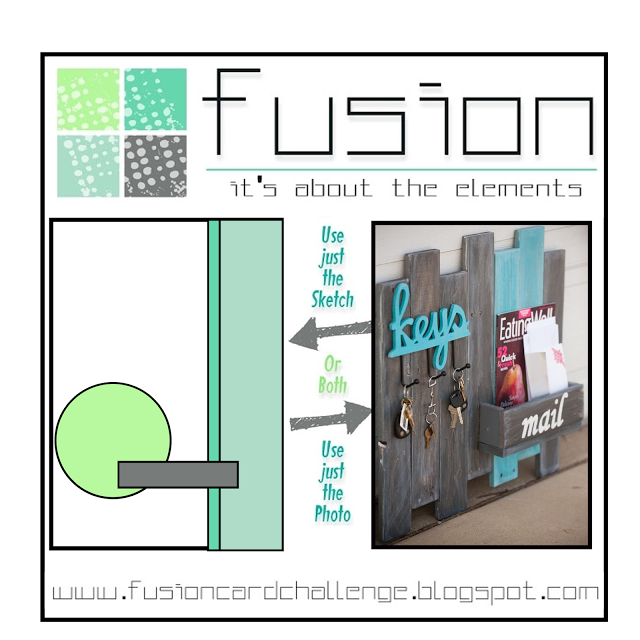 Now it's time to let the DT and guest designer dazzle you with their creations! with our new cue card this week: HUG. Hogs and Kisses! 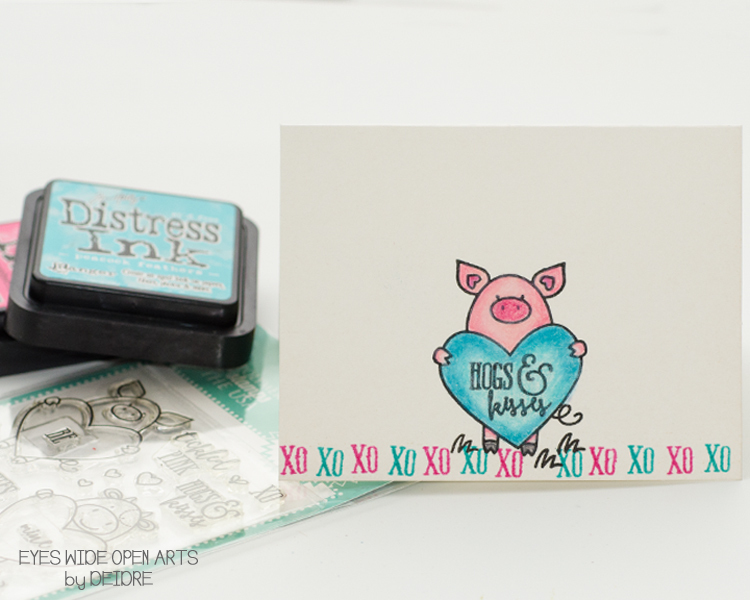 I just couldn't help myself with this cute little Avery Elle stamp set. 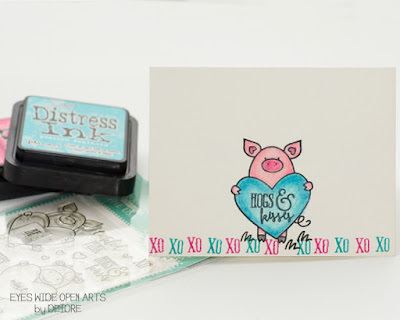 It has lots of cute sayings to use in the center of the animal stamps :) I used Prismacolor pencils for the coloring and Distress Inks for the border. I really hope you "embrace" the DT cards and show them some love too! 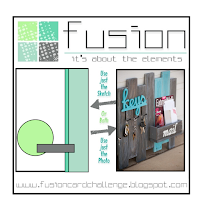 I'm also joining in at Fusion Card Challenge's 4th Anniversary. Wowsers, have I missed crafting and sharing with you. I've been promoted, relocated to a new state, and had to downsize my art space lol. 2018 is here and we have a great cue card at CASology to kick off the year! I'm using two Vera Lane Studio digi stamps that I think are an awesome way to start the year. 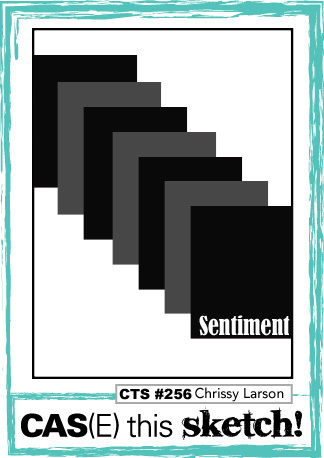 The sentiment is from the set "Apple and Tweet" and the border is a part of a frame from the set "Fun Frames" (which I photoshopped a little to remove the rest of the frame). I used Prismacolor pencils sharpened to a fine point for all the coloring on this card. 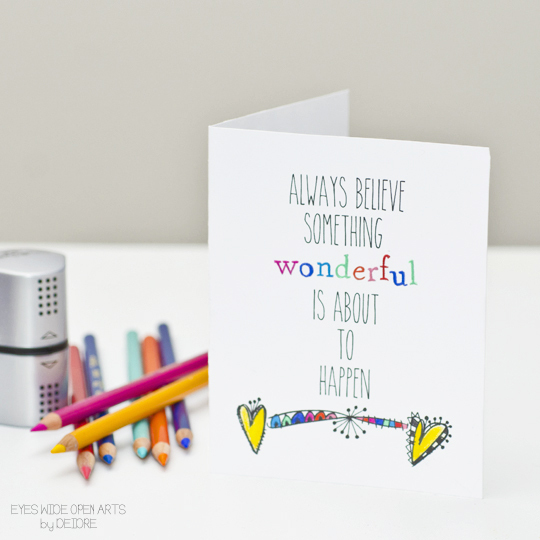 I certainly encourage you to see the rest of the DT cards and our guest designer this week! I can't wait to see what you come up with this week and into the new year.